Emory College of Arts & Sciences has tapped four outstanding seniors for the Robert T. Jones Scholarships to study in Scotland next year. 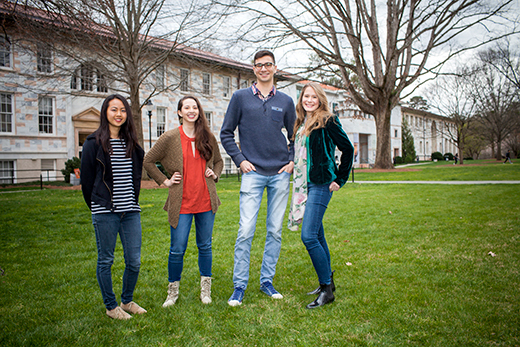 Known as the Bobby Jones scholars, Jason Ehrenzeller, Julianna Joss, Ekaterina Koposova and Joan Shang will join more than 200 previous Emory students who have traveled for a year of study at the University of St Andrews. Emory has hosted the same number of St Andrews students as part of the scholarship exchange started 40 years ago in honor of the legendary amateur golfer and scholar who attended Emory's School of Law. The prestigious program honors the most outstanding representatives from each university, with an emphasis on academic excellence and exemplary character and integrity. The students may take courses without seeking a degree during their yearlong studies in Scotland. But as in previous years, all four 2017 Bobby Jones scholars will pursue master’s degrees in some of St Andrews’ more unique programs, augmenting their research and fellowship work during their time at Emory. Ehrenzeller, a double major in Spanish and international studies, plans to earn a degree in culture identity studies. That will line up with his work at Emory, examining language’s role in identity formation, especially in “hiccups” between nations that speak a common language, like Spanish. As a fellow in the Interdisciplinary Exploration and Scholarship (IDEAS) program, he has served as a teaching assistant in a sidecar class across Spanish and theater, which examines identity in the crossover of language and body. An Undergraduate Humanities Fellow at the Fox Center for Humanistic Inquiry, Ehrenzeller is completing his honors thesis translating a short story by Carlos Gámez Pérez that looks at the same issue in a narrative about a Spaniard who moves to Miami to write about alien abductions. The author in that story begins to think he has been abducted, because the different dialect and style of Spanish he encounters in his daily life begin to inflect his own writing. Koposova is also an Undergraduate Humanities Fellow at the Fox Center, where as an art history major and anthropology minor she is completing an honors thesis on political allegory in the paintings of Baroque artist Peter Paul Rubens. She was given a new perspective on his work by seeing it in person as a John Howett Fellow for Advanced Study in Art History. But she also learned the value of museum works in classes and as an intern at Emory's Michael C. Carlos Museum, working on a program that engages schoolchildren.She will combine those passions at St Andrews, pursuing a master's degree in art history with an emphasis on Rubens’ use of Greek and Roman gods as allegorical representations. It just so happens St Andrews has a museum collection of Roman coins that will help with her study of those images. “Ideally, I will use the course work to deepen my knowledge of the Renaissance and the legacy of classical antiquity and go deeper into Rubens’ images of peace,” Koposova says. Shang, a biology major, also plans to combine her passions for science, medicine and health policy by pursuing a master's degree in global health at St. Andrews. Her initial interest in health care delivery comes from growing up in rural Illinois, an area she realizes could benefit from systemic changes that would increase access to basic medical services in the developing world, too. As a Dean’s Achievement Scholar, she attended the summer Sociology-Comparative Health Program in London to further study health care systems and sociological determinants of health. Shang also has been heavily involved in research at Emory. She is completing her honors thesis under the guidance of ethnobotanist Cassandra Quave, an assistant professor in Emory’s Center for the Study of Human Health and in the School of Medicine’s Department of Dermatology, looking at potential plant-derived antimicrobial agents for fungal diseases. The global health implementation degree, Shang says, will allow her to merge her scientific, medical and policy interests effectively, into a career spent both in the lab and in the field. Joss, a political science and dance and movement studies double major, plans for a master's degree in sustainable development to help with a career in some capacity of community development. She has experience in the field from spending a year as a Community Building and Social Change Fellow, where she worked with residents in the DeKalb Sustainable Neighborhood Initiative. Her effort there to mobilize community leaders resulted in the county agreeing to fund sidewalks along the busy Glenwood Road corridor. Joss also interned with the Southeastern Council of Foundations, through the Ethics and Servant Leadership Summer Intern program. The internship, funded by the Bobbi Patterson Award for Service, gave her a first-hand look at the tools and blind spots of philanthropy work. But the Woodruff Scholar first grew interested in advocacy work when, during the Scholarship and Service summer program, she met an immigrant detainee at the Stewart Detention Center who was under threat of being deported. She ended up co-founding Freedom at Emory, first to hold on-campus panels to raise awareness about the challenges facing undocumented students and later successfully lobbying the university to provide institutional financial aid for those students. In April 2015, Emory announced that it would begin offering private, need-based aid to undocumented students who meet the guidelines of the Deferred Action for Childhood Arrivals immigration policy.